In today’s technological society — that involves texting, Facebook-ing, and Instagram-ing — Canadian children are engaging in less physical activity than ever before. Canadian children partake in much more “screen time” — such as watching TV, playing video games, and using the computer — then in generations past. Using a national physical activity report card, researchers have demonstrated high rates of physical inactivity among children and youth. Due to competing social pressures, adolescent girls, in particular, are the least likely to be physically active. The benefits of physical activity for children’s physical health are well known. In addition to helping children to maintain a healthy body weight, engaging in physical activity improves many other physical health indicators, such as motor coordination, flexibility, accuracy, and lung function to name a few. However, the important link between physical activity and children’s mental and social health, is a lesser-known fact. In today’s society, we often sadly overlook the great importance of “brain health.” Children and youth also experience psychological issues, albeit in a different way than adults. Many children encounter school-related stress and performance anxiety, bullying at school, sibling rivalry, and dealing with domestic stressors at home such as fighting between parents. A subset of children have clinical psychological illnesses, such as anxiety disorders or attention deficit hyperactivity disorder. These stressors that occur during childhood may greatly damage a child’s psychological well-being. Physical activity, however, can act as a powerful buffer against psychological stress. Physical activity reduces mental stress. Physical activity improves self-esteem, that is, a child’s overall sense of personal worth. Physical activity improves self-efficacy, or situation-specific confidence. And, in supportive environments, physical activity can enhance a child’s body image. Although society often wrongly dictates that girls and women should be slender, engaging in physical activity teaches them that it is OK and fun to take up space and to use their bodies in powerful ways. Physical activity also improves cognitive functioning. Some researchers have even found important links between increased school performance and physical activity participation. Therefore, when you are signing up for a sports camp such as the True North Sports Camps, make sure to remember that you will be taking care of your brain! Physical activity has very important social benefits for children. It improves social relationships, bonding with friends, friendship, communication, and a sense of social inclusion. Children who are active are less likely to engage in violent social relationships in the future and are less likely to become pregnant at a premature age through multiple sexual encounters. Certain groups of children unfortunately face many more barriers to engaging in physical activity. Children from lower socioeconomic backgrounds who live in poverty, face many more financial barriers to being active. Children from different ethnic and cultural groups may not feel included in mainstream activities. Children who are living with chronic disabilities and illnesses are often not welcome in physically activity spaces, due to lack of knowledge on the part of instructors, fear for the child’s safety, or simply not knowing how to include a child with a disability. Children who face hardships such as poverty and disability can and should be active too! Therefore, it is important that we encourage ALL children to be active! In 1996, the United Nations recognized “play” as an international human right for children. Thus, all children – regardless of level of ability or skin colour — have the cherished right to play. In many countries around the world, war and religious conflicts deny thousands of children the basic right to play. 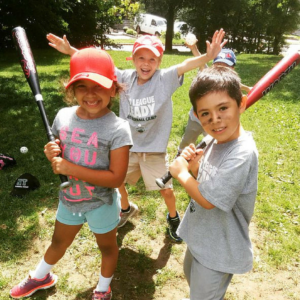 Camps — such as True North Sports Camps and North Toronto Baseball Camp — protect this cherished right for children by ensuring that they receive high quality opportunities to engage in free play. This summer — when you are engaging in free play — keep in mind that you are contributing toward the health of your body, the workings of your mind, and the strength of your social community.